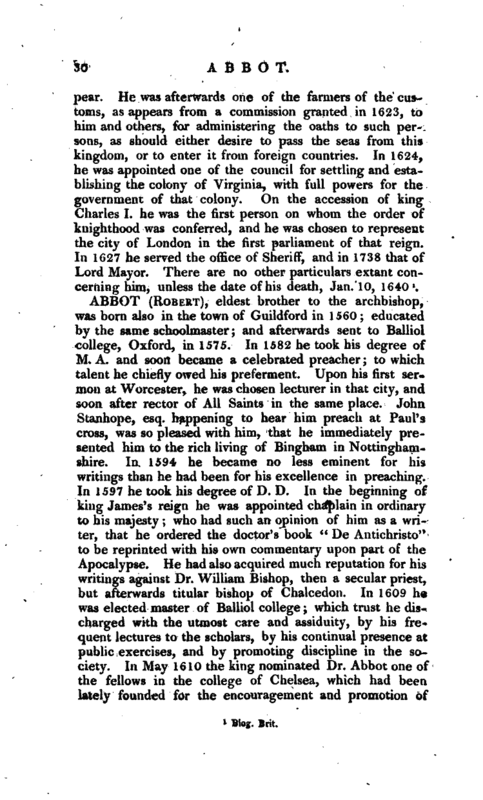 , eldest brother to the archbishop, was born also in the town of Guildford in 1560; educated by the same schoolmaster; and afterwards sent to Balliol college, Oxford, in 1575. In 1582 he took his degree of M. A. and soon became a celebrated preacher; to which talent he chiefly owed his preferment. Upon his first sermon at Worcester, he was chosen lecturer in that city, and soon after rector of All Saints in the same place. John Stanhope, esq. happening to hear him preach at Paul’s cross, was so pleased with him, that he immediately presented him to the rich living of Bingham in Nottinghamshire. In 1594 he became no less eminent for his writings than he had been for his excellence in preaching. In 1597 he took his degree of D. D. In the beginning of king James’s reign he was appointed chaplain in ordinary to his majesty; who had such an opinion of him as a writer, that he ordered the doctor’s book “De Antichristo” to be reprinted with his own commentary upon part of the Apocalypse. He had also acquired much reputation for his writings against Dr. William Bishop, then a secular priest, but afterwards titular bishop of Chalcedon. In 1609 he was elected master of Balliol college; which trust he discharged with the utmost care and assiduity, by his frequent lectures to the scholars, by his continual presence at public exercises, and by promoting discipline in the society. 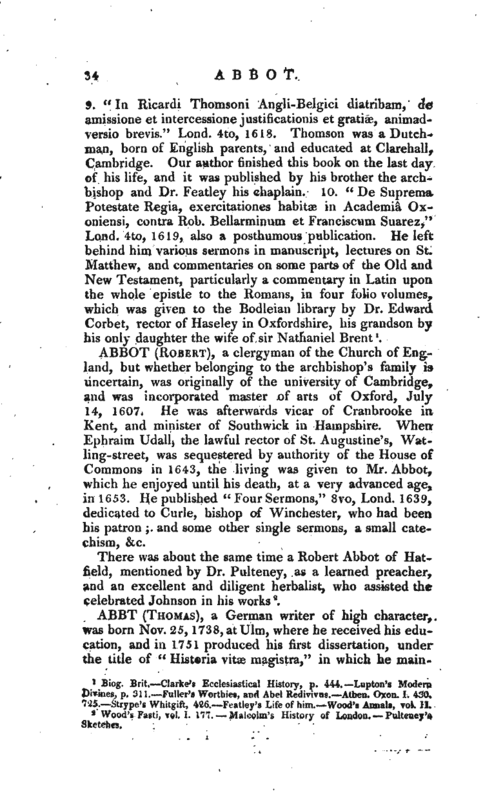 In May 1610 the king nominated Dr. Abbot one of the fellows in the college of Chelsea, which had been, lately founded for the encouragement and promotion of | polemical divinity. In November 1610 he was made prebendary of Normanton in the church of Southwell; and in 1612 his majesty appointed him regius professor of divinity at Oxford; in which station he acquired the character of a profound divine, though a more moderate Calvinist than either of his two predecessors in the divinity-chair, Holland and Humphrey: for he countenanced the sublapsarian tenets concerning predestination. He was not, however, less an enemy to Dr. Laud than his brother; and in one of his sermons pointed at him so directly, that Laud intended to have taken some public notice of it. A few paritculars [sic] hitherto unnoticed by his biographers may be gleaned from Wood’s Annals, published by Mr. Gutch. It appears that in 1596 the corporation of London requested the two universities to send them a list of persons properly qualified for the professorships of Gresham college, just founded. On this occasion Mr. Abbot, then M. A. of Balliol college, was chosen with three others, but the election ultimately fell upon a gentleman of Cambridge. 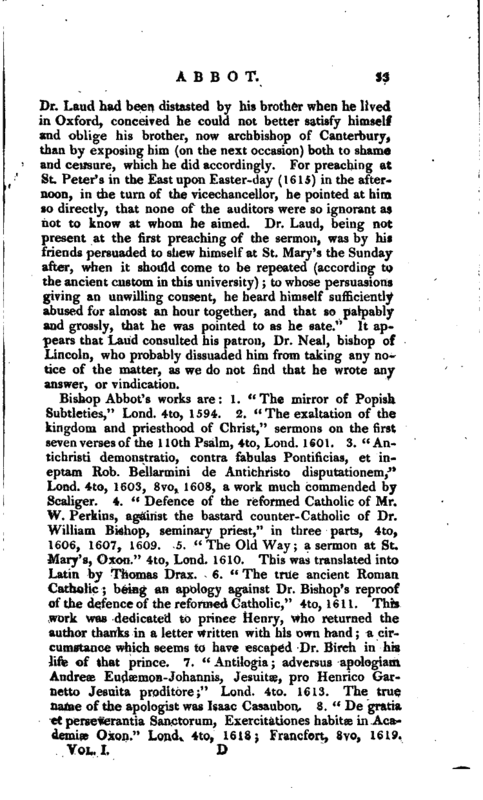 In 1612, Dr. John Howson, one of the canons of Christ church, preaching at St. Mary’s, reflected on the Annotations to the Geneva translation of the Bible, “as guilty of misrepresenting the divinity of Christ and his Messiahship.” For this he was afterwards suspended, or forced to recant, by Dr. Abbot, then pro-vicechancellor. Wood thinks this the more hard, because king James had been known to censure the partiality of these annotations. While king’s professor of Divinity, he had neither the canonry of Christ church, nor the rectory of Ewelme usually annexed; and his only profits were some fees from those who performed exercises in divinity, and a salary of forty pounds a-year paid by the dean and canons of Christ church. 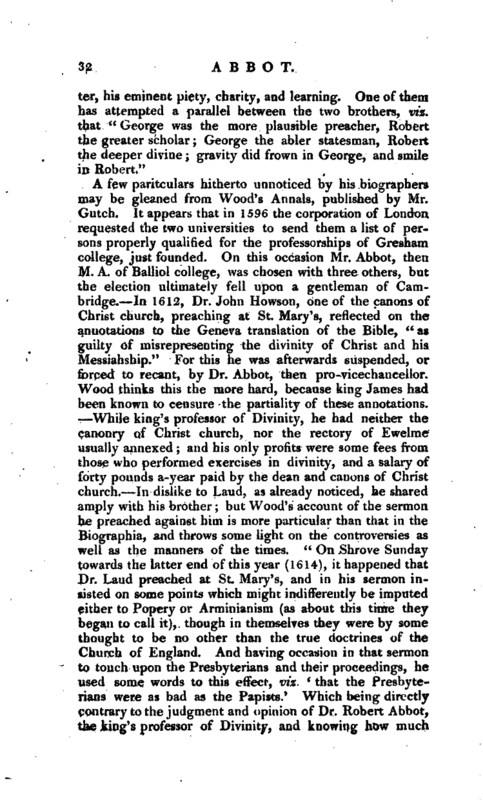 In dislike to Laud, as already noticed, he shared amply with his brother; but Wood’s account of the sermon he preached against him is more particular than that in the Biographia, and throws some light on the controversies as well as the manners of the times. “On Shrove Sunday towards the latter end of this year (1614), it happened that Dr. Laud preached at St. Mary’s, and in his sermon insisted on some points which might indifferently be imputed either to Popery or Arminianism (as about this time they began to call it), though in themselves they were by some thought to be no other than the true doctrine’s of the Church of England. And having occasion in th-it sermon to touch upon the Presbyterians and their proceedings, he used some words to this etfect, viz. `that the Presbyterians were as bad as the Papists.' 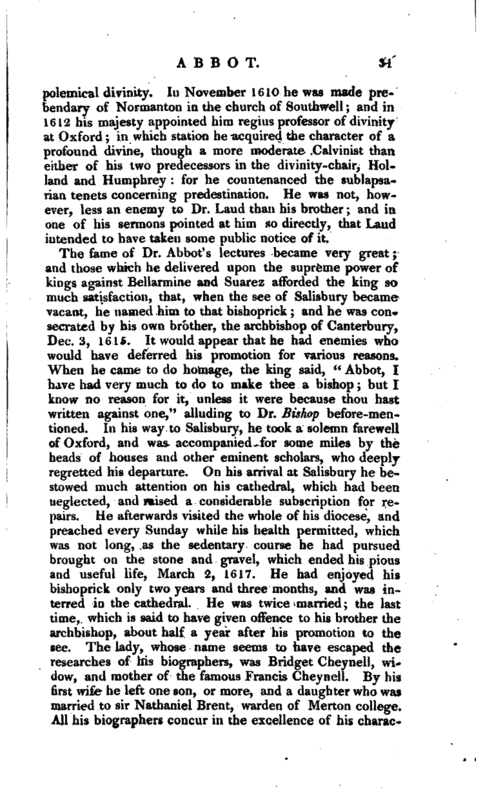 Which being directly contrary to the judgment and opinion of Dr. Robert Abbot, the king’s professor of Divinity, and knowing how much | Dr. Laud had been distasted by his brother when he lived in Oxford, conceived he could not better satisfy himself and oblige his brother, now archbishop of Canterbury, than by exposing him (on the next occasion) both to shame and censure, which he did accordingly. For preaching at St. Peter’s in the East upon Easter-day (1615) in the afternoon, in the turn of the vicechancellor, he pointed at him so direptly, that none of the auditors were so ignorant as not to know at whom he aimed. Dr. Laud, being not present at the first preaching of the sermon, was by hiss friends persuaded to shew himself at St. Mary’s the Sunday after, when it should come to be repeated (according to the ancient custom in this university); to whose persuasions giving an unwilling consent, he heard himself sufficiently abused for almost an hour together, and that so palpably and grossly, that he was pointed to as he sate.” It appears that Laud consulted his patron, Dr. Neal, bishop of Lincoln, who probably dissuaded him from taking any notice of the matter, as we do not find that he wrote any answer, or vindication. Biog. Brit.—Clarke’s Ecclesiastical History, p. 444.—Lupton’s Modern Divines, p. 311.—Fuller’s Worthies, and Abel Redivivus.—Athen. Oxon. I. 430. 725.—Strype’s Whitgift, 426.—Featley’s Life of him.—Wood’s Annals, vol. II.